Once upon a time... or in 1986, PROTILES were introduced into tournament SCRABBLE® play by Bob Schoenman, an expert-level player. 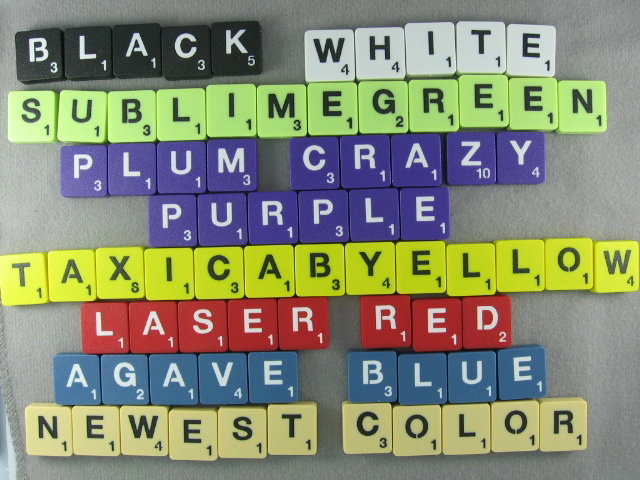 Prior to 1986, wooden tiles from SCRABBLE® sets were used. Many players complained about the indented letters on these wooden tiles, finding them easily "brailled" inside the tile bag. PROTILES made from plastic, uniform in size and shape, with letters/numbers silk-screened atop, instead of indented into the surface of the tiles, were the answer. Since 1987, PROTILES have been featured as the Official Tournament Tiles at all North American SCRABBLE® Championships. 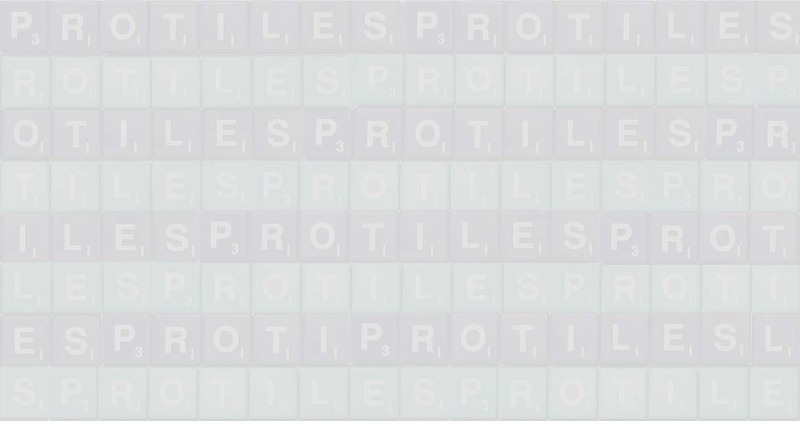 PROTILES have also made official appearances at the 1993, 1997, and 2001 World SCRABBLE® Championships, and the 1988 and 2000 Canadian National SCRABBLE® Championships. More than 30,000 sets of PROTILES have been sold to players all over the world. Introduced in 1990, another PROTILES design--featuring a clear plastic cap and plug with an imprinted piece of paper sandwiched in between--was produced for three years. In 1996, this PROTILES style was sold to Roy Peshkin. In 1996, a new and improved style of PROTILES was introduced. 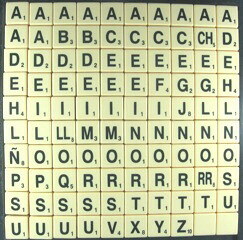 Manufactured with a double-injection molding process similar to the one used in creating telephone keys, these PROTILES feature letters and numbers molded into the body of the tile. With letters and numbers that will never wear off, this style of PROTILES is the closest thing to lifetime tiles you can get! World Class Protiles are the newest members of the Protiles family. Introduced in September 2004 and designed to fit Mattel deluxe boards, these tiles can also be used on Hasbro deluxe boards. World Class Protiles are square instead of rectangular, weigh 25% more than the current versions of Protiles, and their length and width are the same dimension as the width of current tiles. Silkscreen Pink Ribbon tiles were introduced in the Summer of 2006. Each set contains 4 blanks - two "pink ribbon" blanks and two regular blanks - and is packaged in a clear cello bag and tied with pink raffia ribbon. For each "Pink Ribbon" set purchased, Protiles will donate $5 to the Susan G. Komen Breast Cancer Foundation. 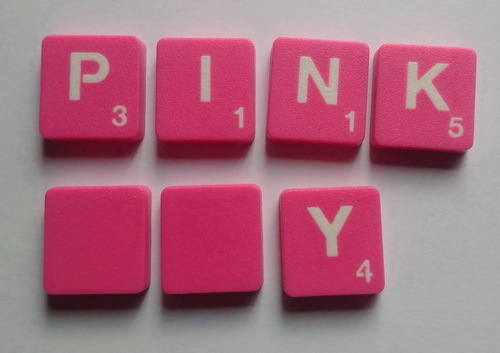 As of June 2008, $740 has been donated to the Komen Foundation, and 40 additional sets of "Pink Ribbon" tiles have been donated to various worthy causes. Read more about Pink Ribbon tiles in this Seattle Times article. In 2006, Protiles celebrates its 20th Anniversary with a new color in the double injection molded lifetime series: AGAVE BLUE. Order your Agave Blue tiles today! 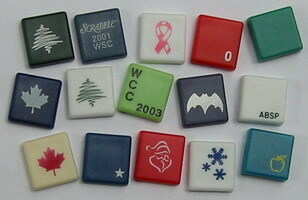 Custom Tile Sets introduced by Protiles in the Summer of 2007. You specify the color, font, and language for your own Original or World Class Protiles. In the fall of 2007, Protiles introduces yet another a new color in the double injection molded lifetime series: LASER RED. Order your Laser Red tiles today! In the July of 2008, Protiles introduces the fifth new color in the double injection molded lifetime series: SUBLIME GREEN. Order your Sublime Green tiles today! December 2008: Protiles introduces the latest new color in the double injection molded lifetime series: TAXICAB YELLOW. Order your Taxicab Yellow tiles today! Protiles Gives Back : After years of donating a $5 from the sale of every set of Pink Ribbon Tiles to the Susan G. Komen Breast Cancer Foundation and donating tiles to school teachers around the country, Protiles is expanding our philanthropic efforts. Beginning June 1, 2009, Protiles will donate 10% of the sales price of every set our customers order to several good causes. Learn more on our Protiles Gives Back page. In August 2009, Protiles introduces the newest improvement to the most durable tiles made yet. These newest Double Injection Molded Protiles are pleasing to the touch and have a textured finish guaranteed not to reflect the glare of overhead lighting at any angle. New colors just keep coming! The Plum Crazy Purple Injection Molded Protiles were introduced in January of 2010. Order now! Spanish - Español World Class tiles were introduced in November 2010. They were used at the Spanish Scrabble World Championship (Campeonato del mundo de Scrabble en español) held in Costa Rica in December 2010. How did we come up with the names of these colors? We let the players send us suggestions and then we picked the best names (see naming contest winners). Nearly thirty years ago I began selling Protiles to club and tournament players all over the world. An estimated 70,000 sets of Protiles have been sold in a variety of styles and colors. I have decided to sell Protiles to a long time friend and business partner, Chief Olobatoke Aka, effective July 17, 2014. Chief Toke, as he likes to be known, has agreed to continue to sell Protiles using the principles that drive the way they have been sold in the past. Chief Toke has been actively involved in Nigeria Scrabble administration for the last 15 years; for 12 of those years as President of the Nigeria Scrabble Federation (2001-2013). He was President of the Pan Africa Scrabble Association (PANASA) from 2002-2010. He is a founding and current member of WESPA (2003 to present). He served as Chairman, WESPA Tournament Sub Committee from 2005-2011. Above all, he is dedicated to the development of Scrabble worldwide. Please join me in welcoming Chief Toke, and his representative in the US, Moses Olubo. Thanks to all of you for your continued support of Protiles.